U.S. Border Patrol agents watch as President Donald Trump visits the banks of the Rio Grande River in Mission, Texas, Jan. 10, 2019. 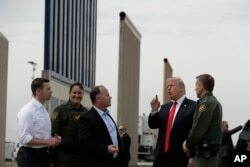 During a visit to the southern border Thursday, U.S. President Donald Trump again threatened to use emergency powers to bypass Congress and get billions of dollars to pay for a wall on the U.S.-Mexico border as a partial U.S. government shutdown over the issue stretched into its 20th day. Here is a look at what such a declaration means. The bill was introduced because of a perceived need to stop open-ended states of national emergency and formalize the power of Congress. The law was enacted in September 1976 to provide certain checks and balances on the emergency powers of the president, including terminating national emergencies two years after enactment. Each House of Congress must also vote on a concurrent resolution to determine whether the emergency should be terminated, no later than six months after a national emergency is declared, and no later than the end of each six-month period thereafter during the emergency. ​Can Trump use emergency powers to build the wall? As president, Trump has the authority to declare a national emergency. However, he may not have the sweeping powers usually associated with the declaration of an emergency. Trump has declared the influx of migrants arriving at the southern border as a humanitarian and national emergency. "We have criminals coming in," Trump said Sunday. "We have human traffickers coming in. We have drugs pouring in. We have things happening that you don't want to even know about." The administration has also talked of terrorists crossing into the U.S. from Mexico. But critics have argued that there is no evidence that migrants massed at the border are anything like the administration claims. Funding the wall might prove to be tricky. One way to get the money would be the use of the military emergency law that allows the secretary of defense to authorize construction projects without authorization from Congress. Media reports Thursday claim the White House is searching for unused funds in the U.S. Army Corps of Engineers budget. The potential revenue stream would come from projects approved in a bill providing disaster relief for Puerto Rico, Texas, California and Florida, the reports say. Congress can overturn the declaration of emergency with the approval of both chambers. But that might prove difficult with Republicans holding the majority in the Senate. The declaration could also face myriad court challenges. Yes. In fact, the United States has been in a continuous state of emergency since 1979. That's when President Jimmy Carter declared an emergency to freeze Iranian assets after the seizure of the U.S. Embassy in Tehran. It has been renewed every year since, by six other presidents. Other emergencies have also been declared since and remain in effect, including President Bill Clinton's 1996 emergency, which was declared after the Cuban military shot down two civilian airplanes off the Cuban coast, as well as one declared by President George W. Bush on Sept. 14, 2001, giving the president broad powers to mobilize the military in the aftermath of the Sept. 11, 2001, attacks. As of now, 28 national emergencies remain active. Most of them come under the International Emergency Economic Powers Act, which grants the president power to impose economic sanctions for foreign policy.